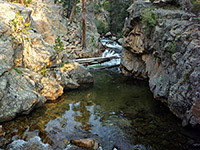 There are several trailheads near Moraine Park Campground, the largest camping area in Rocky Mountain National Park (273 sites), and the most popular hiking destination is probably Fern Lake, reached by a moderate, 3.7 mile hike, all through wooded terrain but with a few points of interest along the way including a rockslide, waterfall and several deep pools. 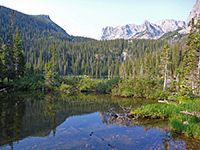 A primitive campground is located by the lake and there are two other campsites at nearby Spruce and Odessa lakes, though apart from these two locations there are no other trails off the main route, which continues over a ridge, past a few other small lakes and descends to the Bear Lake trailhead. Therefore all or most of this section of the park could be seen on a day hike, without need for overnight stays. All the lakes lie just east of the mountain crest and the continental divide, and although the trail stays just below the timberline, even at its highest point of 10,680 feet, bare granite slopes rise up a short distance away, visible once at Fern Lake, and beyond. One option for a side trip into this higher elevation zone is to climb the slopes west of Odessa Lake, soon passing above the forest into rugged Tourmaline Gorge, which contains pretty Tourmaline Lake at the lower end and a glacier at the upper end, in a spectacular cirque bordered by 11,939 foot Gabletop Mountain to the north and 12,331 foot Knobtop Mountain to the south. 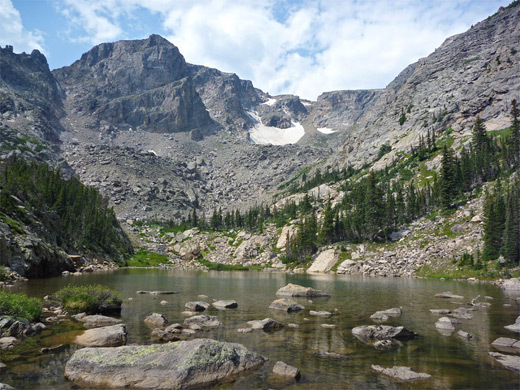 The round-trip distance to here is 10.4 miles (2,440 feet elevation gain), taking all or most of a day, but Fern Lake and optionally Odessa Lake can be seen in about half a day. Rocky Mountain National Park map, topographic map of the Fern Lake Trail. 20 views along the trail - gallery, slideshow. Panorama of Tourmaline Gorge. Full screen version (18 mb). The Fern Lake trailhead is reached by a narrow road forking off near the entrance to Moraine Park Campground, running along the north side of the Moraine Park meadows, which are centered on a marshy stretch of the Big Thompson River. The meadows can be viewed from many little pull-outs along the road; this is a scenic region, popular for wildlife watching, picnicking and fishing. The road becomes unpaved, passes two shuttle bus stops and enters thick, overgrown woodland. The last 0.7 miles are narrower, wide enough for one vehicle only, and end at a rather small parking area holding 15 to 20 vehicles, though there are several overflow parking places a little way back. 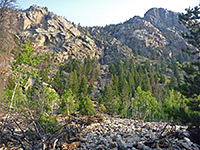 The Fern Lake Trail starts by following the valley of the Big Thompson River westwards, climbing only gently, close to the water but initially out of sight. The surroundings are quite open, a mix of bushes and patches of grass, becoming more wooded after a mile or so, and closer to the river. The path skirts the edge of a recent rockslide, and crosses an area prone to flooding, then winds between two huge boulders, and soon after arrives at a footbridge over the river, close to a junction with a lesser path to Mill Creek Basin. Just upstream is The Pool, a deep hollow below a short cascade. The trail leaves the river, which upstream flows down a very long, deep, straight valley (Forest Canyon) visible from high above along Trail Ridge Road. The next section of the path rises a little more steeply, crosses a tributary (Fern Creek) and is straight for while before bending back, meeting the creek again at Fern Falls, a whitewater cascade flowing into a big pile of broken branches. The trail is noticeably steeper beyond here, switchbacking up the forested hillside and gaining another 400 feet, before moving more directly up a less steep slope, past a junction with the spur to Spruce Lake (1.4 miles), and coming out of the woods at the north shore of Fern Lake. This lake is completely tree-lined, but has rocky peaks rising above to the southwest. Near the lake are a patrol cabin and the 4-site primitive campground. The forest to this point seems relatively dry, and does not have too many wildflower species. The trail continues by crossing the outlet stream (Fern Creek) and following the east shore of the lake, already a little way above the water level, over a boulder field and through cool woodland, where the trees soon hide the lake apart from one open, rocky corner. After a relatively short climb, the route turns south, coming close to Fern Creek once more, as the ground levels out and the path divides again. 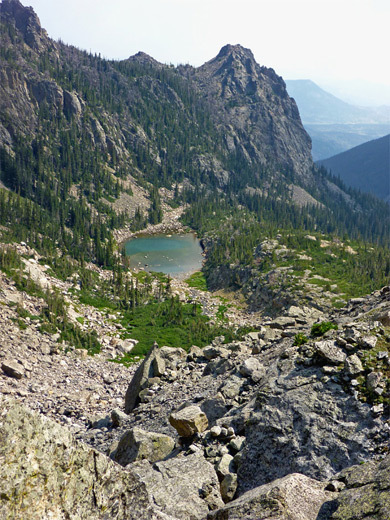 Right is a very short spur to a Odessa Lake, while the main trail approaches the edge of this lake briefly then climbs another 600 feet to the top of a narrow ridge extending southwest from Joe Mills Mountain (11,078 feet), below the much higher summit of Flattop Mountain to the south. Beyond is a lengthy but gradual descent, mostly through woodland, to the Bear Lake trailhead. Odessa Lake is similar in size and shape to Fern Lake, but 480 feet higher, and enclosed by steeper slopes, especially on the west side. Although the shoreline is still forested, cliffs are very close by, rising to the prominent peak of Little Matterhorn. The official (spur) trail ends at the north side of Odessa Lake near the primitive camping area, from where a fainter path continues along the west shore, soon crossing one of the two entry streams, originating at Tourmaline Lake. The off-trail route to this lake, and Tourmaline Gorge, is up the hillside just north of the creek, first through thick forest then across the more open, rockier though slightly less steep slopes above. In places walking is easiest right in the streambed; the creek splits a few times and some stretches flow out of sight, below boulders. Tourmaline Lake is just 0.6 miles from Odessa Lake (560 feet higher) and is rather smaller and generally shallower, with just a hint of turquoise color in the deepest section, in the middle. Many boulders line the north end, as it narrows to the start of the creek, while the south end is more marshy, leading to a small, boggy meadow that contains many wildflowers. A good elevated view of the lake is provided by a low ridge to the west, partly covered by dwarf pine trees. Further west are three major gullies, the most distant containing a small creek, feeding the lake, and originating from an unnamed glacier. Smaller snow patches persist most of the year at the head of the other two ravines. This upper end of Tourmaline Gorge is enclosed on three sides by ever steepening slopes and cliffs, yet some places allow climbing to the crest; two recognized routes are up the easternmost gully to the ridge between Knobtop Mountain and Little Matterhorn, and northwestwards from Tourmaline Lake towards Gabletop Mountain.